PYP members! Are you looking to sharpen your public speaking skills? Look no further! 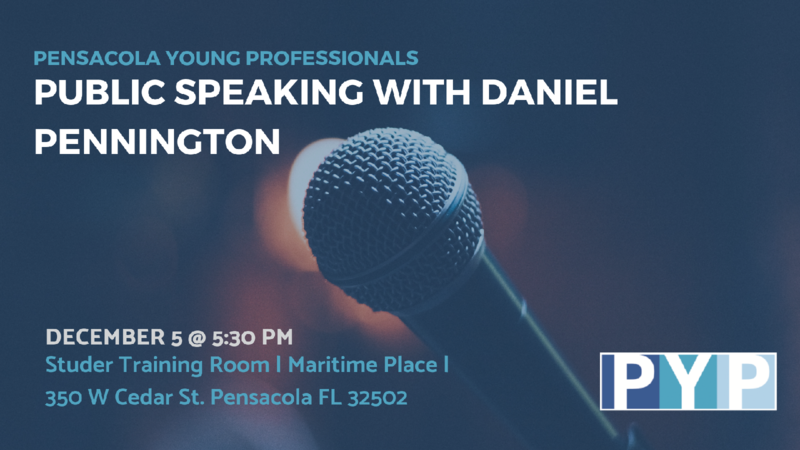 Join PYP on December 5th at 5:30PM in the Studer Training Room at Maritime Place as we learn from Public Speaking Coach, Daniel Pennington. We can't wait to see you there! This is event is open to members only. To secure your attendance to this outstanding opportunity, please register through the member portal link. *Please make sure to login with your login information you created when you joined to be a member to receive membership benefits. If you have questions or concerns, please email info@pensacolayp.com.